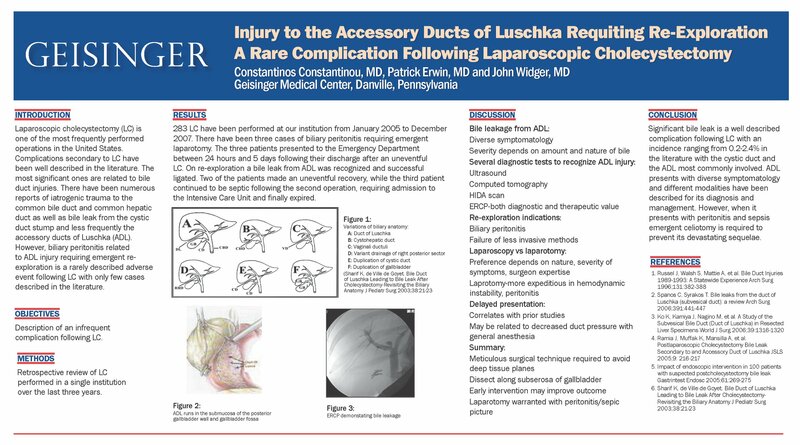 Injury to the accessory duct of Luschka requiring emergent laprotomy. A rare complication following laparoscopic cholecystectomy. Introduction: Laparoscopic cholecystectomy (LC) has become the mainstay for treatment of gallbladder disease. Although biliary injuries are well described in LC, these are mainly associated with common bile duct injuries. There are scant reports related to complications involving the accessory ducts of Luschka (ADL). Case presentations: We present three patients that presented with persistent abdominal pain following their discharge after uneventful LC. Symptoms rapidly progressed to peritonitis requiring emergent laparotomy. Bile leakage from ADL was identified in all three patients and was successfully ligated. Two of the patients had an uneventful post-operative course. The third patient’s clinical condition continued to deteriorate following the second operation. He remained septic requiring admission to the Intensive Care Unit and eventually succumbed to his disease. Conclusion: Injury to the ADL is a rarely described complication following LC. It can present with diverse symptomatology and different modalities have been described for its diagnosis. However, in the presence of peritoneal signs emergent re-exploration is required to prevent its devastating sequelae.